From machine shops to manufacturing plants, passenger cars to commercial trucks and everywhere in between, contamination control is a challenge that must be met in any application where lubricants are needed. Contaminated lubricants can lead to long term damage to systems, greatly reducing their effective life. For a business, this can mean repairs, equipment replacement and unnecessary down time. All of these things cost money and time. However, simple steps can be taken to control contamination and keep everything running smoothly. Particle and Abrasive Contamination – It isn’t uncommon for particles of dust or dirt can get into a lubricant in transit. These often microscopic particles can reduce the life of the lubricant and damage equipment. Once the lubricants are added to equipment, metal shavings, rust particles and other abrasives can lead to even further contamination and damage. Water – Water can greatly reduce the life of a lubricant and cause damage to equipment. Water in load zones can lead to increased surface to surface contact and water in a lubricant sump can produce sludge. It can also lead to rust. Water can be broken down into three forms: dissolved, emulsified and free/pure. Emulsified water is the most damaging to a system. Lubricant Mixing or Choosing the Wrong Lubricant – Mixing different types of lubricants together can result in compatibility issues between additives and cause long term damage. 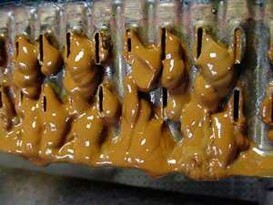 Choosing the wrong lubricant is also problematic, as each piece of equipment will require unique properties from a lubricant. It is particularly important to choose the correct viscosity, but having an incorrect additive package can also be a problem. Now that we have some background about contamination, how do we prevent it? There are a number of ways to do so, ranging from simple procedure changes to complex remediation. Here are a few quick, easy ways to ensure lubricants stay cleaner, longer. 1.Store, transport and handle properly – It might seem simple but following proper storage protocol can go a long way towards preventing contamination. A lot of different particles can get into a lubricant before it even ends up in equipment if it isn’t stored or handled correctly. 3.Testing, testing and more testing – You won’t have any idea your system is contaminated unless you test regularly. Oil and lubricant analysis are a necessity to ensure everything is running as it should be. Choose the analysis program that is right for you, establish some sampling guidelines and get started. 4.Look at the whole picture – When trying to determine what is causing contamination, be sure to take all potential problems into account. You may have stored your lubricant properly, chosen the correct product and taken steps to prevent water infiltration, only to find out your lubricant is still contaminated. Be sure to check every part of your equipment. You may have antifreeze or another fluid leaking into your lubricant. You may have excessive water buildup somewhere you didn’t think of. Check everything, and then check it again. 5.Clean and Filter – If you are switching to a new product, make sure to thoroughly clean out equipment. Even trace amounts of a lubricant left over after draining can cause contamination. It is also important to make sure any and all filters are clean so they are removing any particles they should. If possible, filter new lubricants as well.